Do homegrown sweet potatoes taste better than the canned ones we cover with marshmallows every Thanksgiving? Yes. Yes, they do. They are also so easy to grow it’s a wonder that every house with a yard doesn’t already have its own sweet potato garden. If you are ready for the incredibly fresh, full flavor and perfect nutrition of home-grown sweet potatoes, this article is for you. We will explain how to grow sweet potatoes organically, what the best planting methods are and when to harvest your tasty spuds. About 90% of the world’s sweet potatoes are currently grown in China. While 40% of these sweet potatoes are used for animal feed, the other 60% is free to work its way into the human food supply. Unfortunately, many of China’s commercial harvests are known to be grown next to chemical waste plants due to lax regulations. Even crops in the U.S. can become contaminated by careless practices or accidents. These poisons can and will be absorbed into the storage roots of this plant, making them a source of toxins instead of healthy vitamins and minerals. Thus, the main benefit of learning how to grow sweet potatoes in organic farming is knowing where your food comes from and that it’s safe to eat. If you have control of your food crops from day one, you’ll know exactly what is going into them. It may seem a daunting task to grow plants organically when it’s so easy to reach for the bottle of bug spray or the chemical fertilizers. 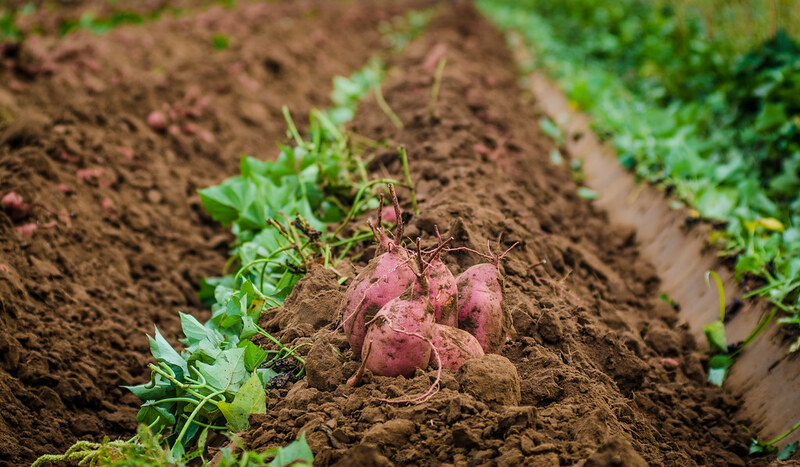 Fortunately, sweet potatoes are not a particularly fussy crop and are ideal for first-time organic farmers. While you are learning how to grow sweet potatoes, take comfort in the fact that they have grown natively in many parts of the country for centuries without the aid of any commercial products. In fact, they are downright invasive in some climates, so this is one crop that you can definitely grow the natural way. Your biggest enemy won’t be your black thumb, but the white fly, so we will address this problem in the last section. 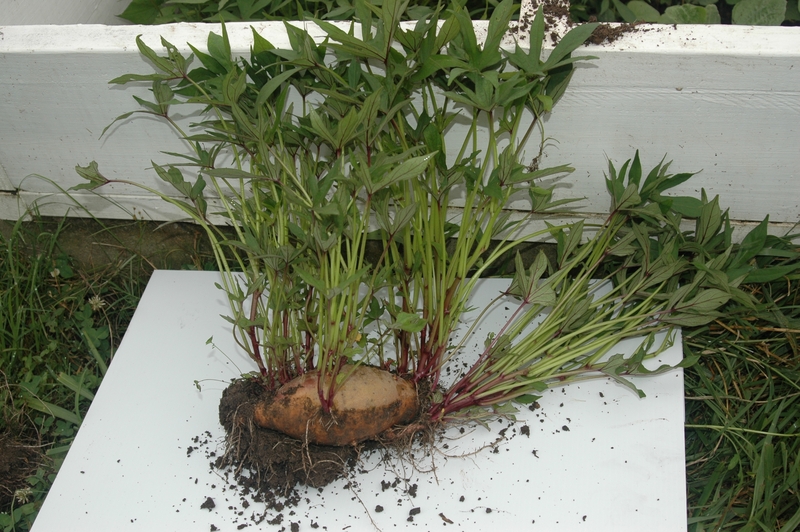 Sweet potatoes grow best in deep sandy loam so their storage roots can expand easily and uniformly. The soil should also be fertile. If you do not have any soil that will be suitable in your planting area, you can amend it with CLEAN sand and organic compost. This will work even for heavy clay soils with a little elbow grease. Be sure not to add too much sand. The soil should still have enough dirt to provide structure and fertility. Make sure you have plenty of this soil because sweet potatoes take up a lot of space, but they’re worth it. Some larger commercial organic producers use flaming (burning out the weeds) in big fields, but this is obviously not practical on a small scale. Knowing how to grow sweet potatoes organically on a small scale requires a little ingenuity and a small amount of extra effort. Work your soil into hills or ridges about 8 to 10 inches higher than the surrounding soil and then line the ridges with plastic mulch. It’s understandable if the word “plastic” immediately sets your back up when it comes to organic farming methods. Section 205.206(c)(6) of the National Organic Program allows for the use of plastic mulch IF it is removed completely from the field at the end of the season. However, if you are not a fan of plastic mulch, another option is to use organic paper mulch. It will not provide the same benefit in warming the soil, so crop yields won’t be as large, but the choice between plastic or other mulches is a personal one with crop yield being only one of the many points of consideration. Another option is not to mulch and pull weeds the old-fashioned way. Most sweet potatoes require 110 to 150 days without frost to provide a crop. If you live in the north, however, there is a variety called Georgia Jet which only requires 90 days to fully mature. Use a Farmer’s Almanac or another resource to figure out how many frost-free days you have per year and then purchase your starters accordingly. One of the most interesting facts you will discover as you learn how to grow sweet potatoes is that this vegetable is not started from seeds. Instead, you will need to purchase slips of your preferred cultivar. Basically, slips are the new plants that shoot out of the sweet potatoes that don’t get eaten. You can actually produce your own slips if you want by cutting some of your own sweet potatoes in half and placing them in a shallow glass with the cut half of the potato below water and half of it above the water. You can suspend them with toothpicks if needed to achieve this. Place it in the sun and keep the water at the same level, and in a couple of weeks, your sweet potato halves will be covered in slips with tiny leaves. You can then gently pull each of the slips off the potato and place the broken end of the slip in a shallow dish of water to grow roots. Once they have a healthy supply of roots that are at least 1 inch in length, they are ready to plant. As long as you take adequate weed control measures, you should have a carefree crop. But, as promised, here is how you get rid of white flies. Many white flies have developed immunity to chemical insecticides, so they are becoming largely useless. Organic methods provide better control. First, prevention is worth a pound of cure, so encourage the production of ladybugs and lacewing larvae when your plants are young. You can buy these bugs at garden centers and release them into your garden. At the first sign of a white fly infestation, wash off the plants but don’t use any toxic chemicals or soaps because they will kill your beneficial insects. Use Safer Soap according to the package instructions if you see a lot of flies or, better yet, make your own insecticidal soap. If it’s getting really bad, you can use Neem oil. This will be safe for your ladybugs because Neem oil kills the insects that eat the leaves that it is sprayed on. Ladybugs aren’t very good vegetarians, so they’ll just eat the bugs that haven’t died yet. Finally, after 3 to 5 months of letting your crop grow, it’s time to enjoy the fruits of your labor. You will know that your sweet potatoes are ready for harvest when the leaves start to turn yellow. Sweet potatoes bruise easily, so use care when digging them up. It’s best to use your hands and a small spade if possible. Just dig out about a foot and a half away from the bottom of the plant and loosen the soil. Once it’s loose enough, it should be easy to gently pull them out of the ground. Once you taste your own delicious home-grown, fresh sweet potatoes, you will wonder why you ever bought one from the store. 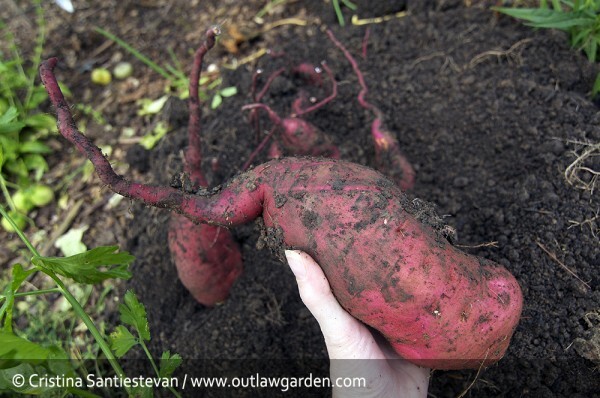 Hey Buddy!, I found this information for you: "How to Grow Sweet Potatoes in Organic Farming". Here is the website link: https://backtofarm.com/how-to-grow-sweet-potatoes/. Thank you.